Initially, many inhabitants of Rafina stood hostile to the operation of the camp, demonstrating racist and xenophobic attitudes. After various bargainings with the authorities, these reactions have subsided, for two main reasons: On the one hand by settling the “semi-closed” operation of the camp, for single-parent families (women with children), with military administration inside and police patrol outside, in order “to ensure the protection(!) and health(!) of the Rafina citizens”. On the other hand with the prospect of legalizing unauthorized settlements within the violated forest areas. “We welcome but there is a price to be payed”. Already in this vein, there have been observed phenomena where neighbors use refugee families for households with humiliating “black” wages. In this concentration camp there are around 100 women (with a prospect to accommodate up to 300), Afghans and Syrians, children and adolescents, either because they lost their male relatives during the traveling, or because they expect a possible integration in the project of family reunification. So they live in the overcrowded accommodation of this former summer-camp, 2-3 families together, with no personal space. Blocked in the camp due to the lack of transport to the city (sparse and long itineraries that stop at 2pm), to the schools, to the health center (which is necessary because of cases of severe diseases requiring systematic monitoring). With a limited possibility to communicate, since the camp does not dispose, as required, a permanent interpreter for the two languages, making useless even the presence of the military doctor. Moreover, the meals of low nutritional value and quality demonstrate that the relevant EU funds are consumed between managers and catering companies. The Initiative of Solidarity with the Refugees and Immigrants of Rafina was formed by citizens of Rafina and residents of nearby areas, since the announcement of the plans for operating the “hospitality center”. Our first encounters with the refugees were in the camp gate because the entrance to the camp is prohibited unless you get permission from the minister of immigration, Mouzalas! That was told to us by the cops, the militaries and an anonymous supervisor standing in the gate. The need, however, for human contact outside the camp boundaries is what motivates them up until today to come out of the camp every Sunday in order to meet with us. In these meetings we were able to build relationships of trust between us and to convene together in assemblies with simultaneous interpretation and children’s games despite the cultural differences that exist even among the refugees. This relationship finally lead us on to the mutual and successful assertion of our entrance in the camp. 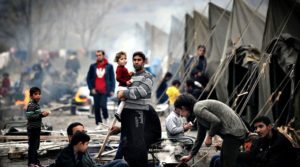 With the new model of management of the migration issue by the SYRIZA-ANEL government and the EU, the sole responsible for the lives as well as the everyday life of refugees is the state, the army, the police, the coast guard, FRONTEX and NATO, NGOs, and the “charity” of the rich, displacing the spontaneous and self-organized solidarity and the substantial contact of parts of our society with the refugees and immigrants, stacking them in controlled camps scattered throughout Greece, mostly in non-urban areas. Faced with this reality, we see ourselves, part of an unguided movement which was developed since the first migration flows during the summer of 2015, with structures-occupations-initiatives. We stand with solidarity next to the immigrants, we support their demands and we fight together for a life with dignity, against a multi-speed society where those refugees and migrants who will not be deported are doomed to form the new bottom of the society. A population vulnerable to the exploitation of cheap labor, either here or in the European countries that may seem as ideal destinations. What differentiates us from the charity, is that our action is not exhausted outside the barbed wire of the ghetto. We do not want our fellow people confined in concentration camps and deported back to places of poverty and war. For those who choose to stay here, the answer is not confinement or social exclusion. We want them to be near us, to be our neighbors (in houses not in camps), our co-workers with equal labor rights, with their children in the same schools as our children. To build together communities of solidarity and struggle against capitalist barbarism, wars, exploitation and racism. Communities where we defend our common interests away from racial or other discriminations, coexisting with our different cultures. The assemblies of our initiative are held every week and are open to anyone who wants to participate. Our goal is to connect with other self-organized structures and expand our actions until the abolishment of every concentration camp.